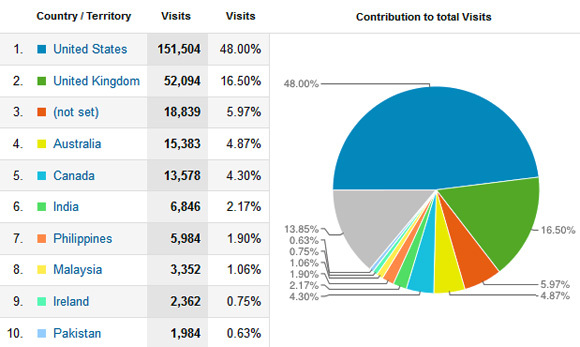 On any given month Antranik.org receives the following traffic (and it’s all thanks to you, my beautiful readers). I’m proud to say that a large chunk of the visitors are nursing/premed students googling topics related to anatomy, physiology and pharmacology and discovering my articles. So the demographics are such that many of visitors are educated and dare I say, compassionate. I offer many ways for you to build your brand and bridge my visitors to yours. Image ads appear on every page on the right side. 250 x 250 pixels (2 slots available, right sidebar). I don’t offer standalone text link ads, but I do offer contextual link ads. I will place a context link within one of my posts on my site for the amount of $50 per link per year. 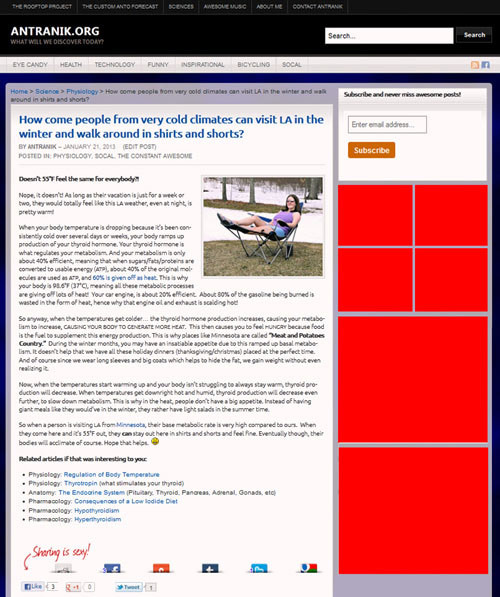 Example of a context link: I will link words of your choosing such as “bicycling” from a cycling related post of your choosing to a page on your site which is cycling related. This advertising option is at my discretion only. This option combines a review of your product/app/site and a direct link to your site. Sponsored reviews receive at least 24 hours as the top front page post (i.e. a ‘stickied’ featured post). This gives your review maximum exposure to our readers. Context Links within Posts: $50 per link per year. Exclusive Post Advertising: Contact me with your offer. Advertising fees must be paid in advance and are non-refundable. Payments accepted by PayPal or Check only. I reserve the right to reject or remove any ads with or without cause. You will be reimbursed a pro-rated fee in the rare event that your ad is removed without cause. No advertising involving scams or adult material. All image ads must not contain objectionable material. Image ads may be animated but must not require Flash. Image ads must not exceed 30kb. I’d love to answer any questions you might have about launching your ad campaign on Antranik.org. Please use the contact form to send me a message. Thank you in advance for your inquiry.